After a wild period of youthful years, involving a set of armed robberies and the shared love of Lole, Ugo, Manu and Fabio go their separate ways. Twenty years later and Ugo returns to Marseilles to avenge the death of Manu, who is reputed to have been killed by the Mob. There he meets, Lole, sending her away as he prepares his revenge. As he flees from killing who he thinks is responsible for Manu’s death, Ugo is gunned down by the police. At this point, Fabio Montale, now a cop, enters the fray seeking justice for his childhood friends. However, neither his colleagues or the Mob want Montale poking around, and the situation soon descends in total chaos. Total Chaos is the instalment in Izzo’s Marseilles Trilogy featuring Fabio Montale. 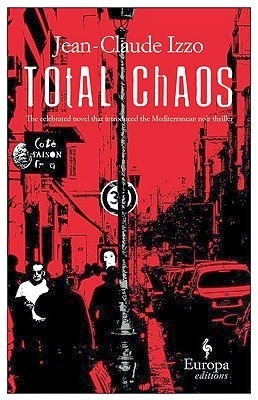 First published in 1995 it is said to be the originator of ‘Mediterranean noir.’ The strength of the story is its very strong sense of place and time, with Izzo placing the reader in the complex social geography of the Marseilles and its mix of immigrants, stalling economy, racial and class tension, corruption, and its sights, sounds, smells and taste (especially food); it's a city he clearly loves despite its tensions and problems. The characterisation is well realised, with a fairly large cast of players. The story itself, however, is a little too complex, entwining two separate plotlines, relying on a couple of plot devices to do so, and overall it feels a little too contrived and with too many cliches in terms of the characters and plot. As a result, I was never quite captured or captivated by the story. Nevertheless, it’s an interesting enough noir read, with a very strong sense of place. I really enjoyed the trilogy precisely for its sense of place, and also for the heavy sense of fatality looming over all.